Here in the UK we have been enjoying the latest screen incarnation of Sherlock Holmes. Hot on the heels of Robert Downey Jr’s steampunkish feature film interpretation, Benedict Cumberbatch has starred in the BBC’s Sherlock as a modern day consulting detective. It is a compelling portrayal of a self-described ‘high-functioning sociopath’, and of course is just latest in over a century of screen and stage interpretations of Arthur Conan Doyle’s character. Doyle is the next subject in our series on literary figures and silent films (see earlier posts on Thomas Hardy, J.M. Barrie, Evelyn Waugh, John Buchan, Bernard Shaw and Leo Tolstoy), where each figure is seen to have faced faced up to the upstart phenomenon of motion pictures in a different way. For Doyle, key matters were seeing a character you had created turned into film while you were still writing the stories, and the vexed issue of copyright. Note: This post is accompanied by a separate filmography for Arthur Conan Doyle and silent era film. Arthur Ignatius Conan Doyle (1859-1930) was a physician and a prolific author of novels, short stories, plays, pamphlets, non-fiction books and poetry. His historical and romantic adventure novels included Micah Clarke (1889), The White Company (1891), The Exploits of Brigadier Gerard (1896, originally a set of short stories), Rodney Stone (1896) and The Lost World (1912, the first of a series of Professor Challenger tales). His plays included The Story of Waterloo (1907) and The House of Temperley (1912); influential pamphlets included The War in South Africa: Its Cause and Conduct (1902) and The Crime of the Congo (1909). He wrote much else besides. For all his prodigious literary output, Doyle became predominantly known in his lifetime – and ever since – for the Sherlock Holmes stories and novels. Beginning with the novel A Study in Scarlet (1887), Doyle produced fifty-six Sherlock Holmes short stories (mostly published first in the Strand Magazine) collected in several volumes, and three further novels, The Sign of Four (1890), The Hound of the Baskervilles (1902) and The Valley of Fear (1915). Though a number of his plays and adventure novels were filmed during the silent period, it was the Sherlock Holmes stories that attracted film producers the most. The last Sherlock Holmes story was not published until 1927, so Doyle witnessed the extension and wider distribution of his character into other media (there were stage interpretations as well) even as he was still having to think up new stories. He saw the character he had created take on a life of its own, appropriated by other media, embedded in popular culture, to a point where he ceased to have full control over it. Even when he wanted to kill off Sherlock Holmes his public forced him to bring his creation back to life. It is not clear whether Doyle was aware of the Danish series specifically, but he was certainly aware in general of films being made which featured his character, which raised the vexed problem of copyright. To what degree did Doyle have any ownership over the character he had created? 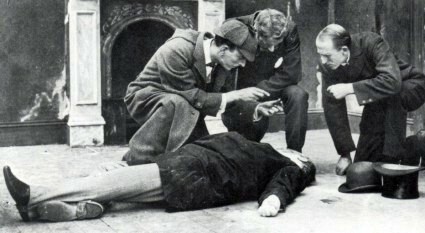 The situation was unclear, particularly if someone avoided using one of Doyle’s stories or copying the look of Holmes from the Sidney Paget illustrations. In the film world copyright in creative works adapted for the screen had only been recognised since 1911 (in the USA), following a celebrated case concerning a film of Ben Hur (1907), where the producers Kalem had not paid any fee to the author’s estate. 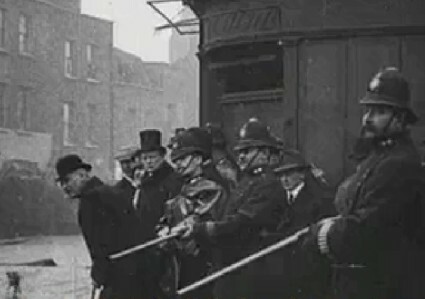 In the UK the Karno v Pathé Frères case of 1908 had shown that a film of a dramatic work was a copy of that work, but the situation remained unclear until the Copyright Act of 1911, which recognised motion pictures are works in their own right (and potentially infringing works) for the first time. … our rights is an asset which is rising in value, no one knows quite how much. English cinemas films are in their infancy, but promise well, and it is there that our hopes lie. Unhappily the higher literature of thought and pathos is handicapped as compared to mere plot and action. Doyle therefore saw limited opportunities for his grander novels given the supposed limitations of the silent film, but for lower literature (which is how he viewed his Holmes stories), the films offered opportunities – for authors prepared to wait, as the fees they could command got higher. Doyle’s answer to the challenge posed by the Nordisk films was to sell the film rights to some of the Holmes stories to a film company on a one-off basis, not long after the Copyright Act came into force. For reasons that are unclear, he did a deal with the French company Éclair (though a producers of the Nick Carter series the company may have asserted particular expertise in detective dramas). After an initial foray with Les aventures de Sherlock Holmes (1911), the first official Sherlock Holmes film (Holmes was p;layed by Henri Gouget), Éclair filmed eight two-reelers in Bexhill-on-Sea in Britain in 1912 through a subsidiary, Franco-British Film. With titles such as Le ruban moucheté aka The Speckled Band and Flamme d’argent aka The Silver Blaze these were the first film adaptations of Holmes stories, though indications from reviews are that the results bore scant relation to Doyle’s plots. The films’ producer Georges Tréville is understood to have played Holmes himself. Two episodes of the eight survive (The Copper Beeches and The Musgrave Ritual). Doyle had more luck with producers adapting his other novels (at least accuracy-wise), with the British company London Film Productions producing prestigious feature film versions of The House of Temperley (1913) and The Firm of Girdlestone (1915). Films borrowing the Sherlock Holmes character continued, with Viggo Larsen, star of the Danish series, moving to Germany for five titles in the Arsène Lupin contra Sherlock Holmes series (1910-11), while the American company Thanhouser made Sherlock Holmes Solves ‘The Sign of Four’ (1913) without any certain acknowledgment of Doyle’s ownership. But it was in Germany where copyright infringement was most flagrant, with Jules Greenbaum (producer of the Arsène Lupin series) making a massively popular six-part series (strictly speaking he wasn’t involved in part four) very loosely based on The Hound of the Baskervilles, which ran 1914-1920, with Alwin Neuss and others playing Holmes. 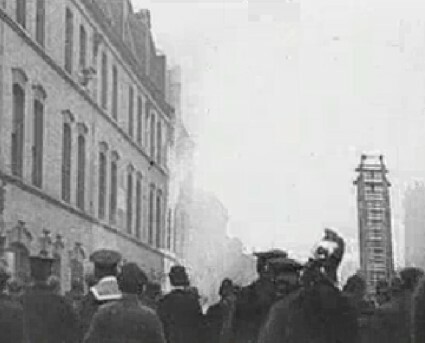 Doyle really only had control over what was produced in Britain, and the next offical Holmes film was A Study in Scarlet (1914), directed by George Pearson for G.B. Samuelson, with James Bragington playing Holmes (he was not previously an actor but an office worker picked for his Holmesian looks). In the same year the same novel was adapted in the USA in a completely unauthorised version, directed by and starring Francis Ford, brother of John Ford. In 1921 Doyle finally did a deal with ‘English cinema films’ that matched his expectations financially while satisifying his hopes for a respectful adaptation from page to screen. 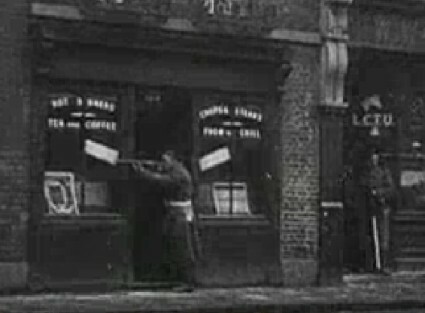 The Stoll Film Company was the leading film company in Britain, newly established by theatre magnate Sir Oswald Stoll with high ambitions to raise the quality of British films. Central to Stoll’s plans was adapting popular novel and plays with a ready-made audience, while its strongest suit (outside Sir Oswald’s money) was director Maurice Elvey, easily the most talented filmmaker in Britain at the time. However, what made the Stoll Holmes series such a success was its choice of Holmes. At the age of sixty, Eille Norwood was hardly ideal for the role, and with an average stage and occasional screen career behind him, his name alone was not a draw. 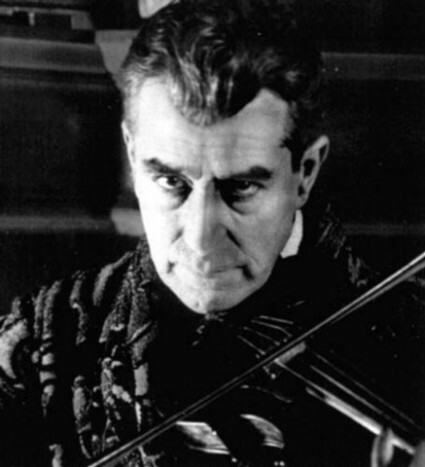 But his somewhat cadaverous features echoed the Sidney Page illustrations of Holmes in the Strand, and on screen the transformation was complete. Norwood’s subtle portrayal was grounded in a close reading of the original stories yet was equally attuned to the needs of the screen. Plot sensations (the hallmark of earlier Holmes films) were kept in moderation; now the drama could be read in the detective’s eyes. For the first time one could see the mind of the great detective at work. It helped greatly that Norwood had the ideal foil in Hubert Willis as John Watson – a genial, loyal companion perpetually dumbfounded by the workings of the brighter, deeper mind of his companion. The series of two-reelers (approx. twenty minutes each), entitled The Adventures of Sherlock Holmes and set in the 1920s, ran to fifteen episodes and was issued throughout 1921. 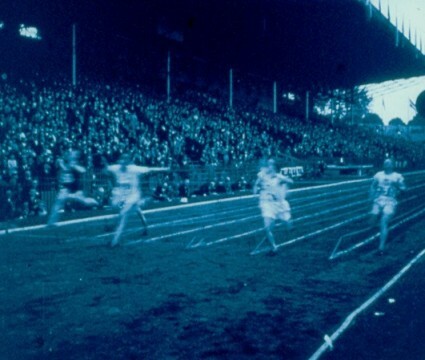 It was enthusiastically received in Britain and the USA, with Norwood’s pinpoint interpretation the focus of the praise, though one would now want equally to highlight Elvey’s deft, filmic handling of the material. 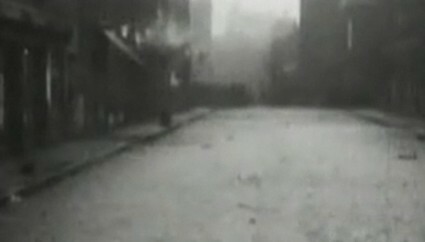 A rousing feature film followed, The Hound of the Baskervilles (1921, a powerful influence on the young David Lean). Elvey left for other duties to be replaced for two further Stoll Holmes series, The Further Adventures of Sherlock Holmes (1922, fifteen episodes) and The Last Adventures of Sherlock Holmes, 1923, fifteen episodes) directed by the plainer talent of George Ridgwell. Elvey returned in 1923 to direct a second Holmes feature film, The Sign of Four. 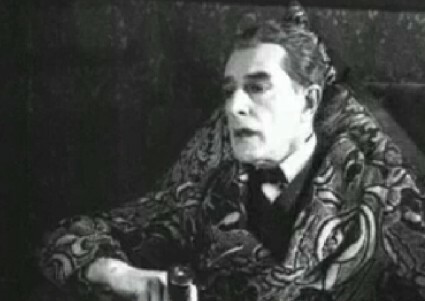 All films in the Stoll series starred Eille Norwood, who also took his successful interpretation of Holmes to the stage. Of his screen successors, only Basil Rathbone and Jeremy Brett have been his equal for inhabiting the spirit of Doyle’s creation. However, the Stoll series raised the thorny issue of copyright once more. Doyle had instructed his literary agent to check the validity of his copyrights in the USA before he signed his deal with Stoll in 1920, but American interests challenged the Stoll series nonetheless. 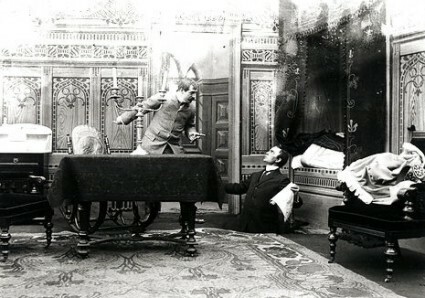 The Goldwyn Corporation argued that Doyle had sold the dramatic rights to the Holmes stories when William Gillette had created his stage version in 1899, rights which then passed on to the Essanay company in 1916 when a feature film was made of Gillette’s play (starring Gillette), and then to Goldwyn, which produced the feature film Sherlock Holmes in 1922, with John Barrymore as the detective. The case was thrown out by the New York Supreme Court, but it demonstrated the muddle that Doyle (or his representatives) had created and the difficulty the law had in separating stage from screen. Doyle’s other literary works were also filmed during the silent era. Aside from the London productions of The House of Temperley and The Firm of Girdlestone mentioned above, there were British films made of Brigadier Gerard (1915), Rodney Stone (1920), The Croxley Master (1923) and The Tragedy of Korosco, filmed as Fires of Fate (1923). In France, Éclair returned to filming Doyle with Un drame sous Napoléon (1921), based on Uncle Bernac, while in the USA First National made the hugely successful The Lost World (1925), with its Willis O’Brien-animated dinosaurs and Wallace Beery as Professor Challenger, while Rod La Roque starred as Brigadier Gerard in The Fighting Eagle (1927). By the time of the great successes of his works in the film world in the 1920s, Arthur Conan Doyle had turned much of his attentions to spiritualism. This side of his personal history is remarkable for the stubborn credulousness he displayed (for example, refusing to believe that Harry Houdini did not have supernatural skills, even when Houdini carefully explained how his tricks were done), but there are few crossovers between his passion for spiritualism and motion pictures. However there are some. Although Doyle only became heavily involved in spiritualism after the First World War, he had shown interest in it and in the allied areas of hypnotism, seances and psychic research as far back as the 1880s. 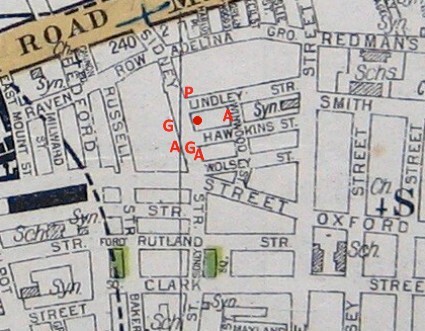 Fascinatingly, Andrew Lycett notes that in 1888 Doyle was in contact with Frederick Myers, a leading figure in the Society for Physical Research, who introduced Doyle to George Albert Smith, then a stage hypnotist whose fraudulent ‘second sight’ act conned the naive SPR members much as Doyle would be willingly conned by spiritualist evidence twenty years later. 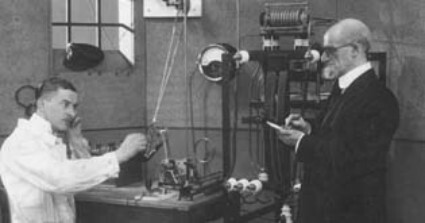 Whether Doyle actually met Smith Lycett does not say, but Smith would soon abandon his stage career and become a leading filmmaker in Britain in the 1890s (including making films that mocked his former associations, such as The Mesmerist, 1898) and the inventor of the world’s first successful motion picture colour system. 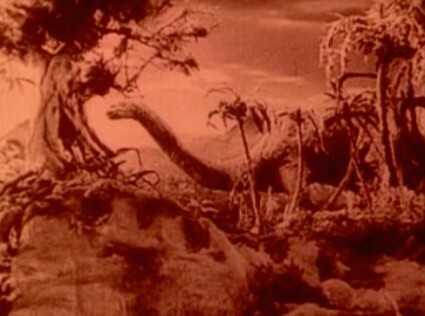 This intriguing association aside, in 1922 Doyle used rushes from The Lost World to startle an audience of magicians who could not rationalise what these living pictures of dinosaurs were, while a 1923 documentary, Is Doyle Right?, made by Cullom Holmes Ferrell, purported to explore Doyle’s theories (Doyle had no connection with the film himself). Finally there are the silent films of Doyle the man. He appeared in at least two American films as himself, when actuality film was taken of him on his visit to the USA in 1914. His friend the American detective William J. Bryan filmed him for a drama in which Bryan starred as himself, The $5,000,000 Counterfeiting Plot (1914), while through the same association with Bryan Doyle also found himself appearing in episode 26 of the serial Our Mutual Girl (1914). In both cases Doyle was briefly filmed as himself, not taking part in the drama in any way. Doyle also appeared in a prologue to The Lost World, once again as himself (a sequence missing from existing copies). He also appeared in some newsreels, notably a 1929 Fox Movietone sound interview (released 1929 but filmed in 1928, according to Greg Wilsbacher’s research in the 2009 Pordenone catalogue), where he spoke about spiritualism and helped usher in the talkies. 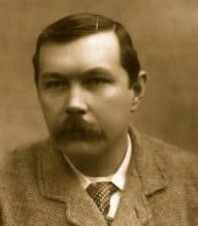 Like any professional author of his age, Arthur Conan Doyle was necessarily bound up with the motion picture industry. The movies wanted to film his works, wanted to appropriate his characters, and wanted to film him. 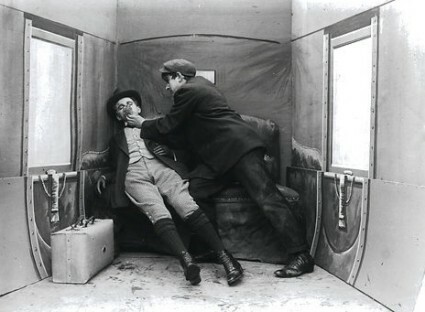 The filmography of Doyle and silent era films that acompanies this post has been a challenge to compile, because of the elusiveness of some of the information but also because of problems of definition. When is a Holmes film not a Holmes film? The so-called first Sherlock Holmes film, Sherlock Holmes Baffled (1900) is a knockabout spoof with seemingly minimal connection with Doyle’s detective. 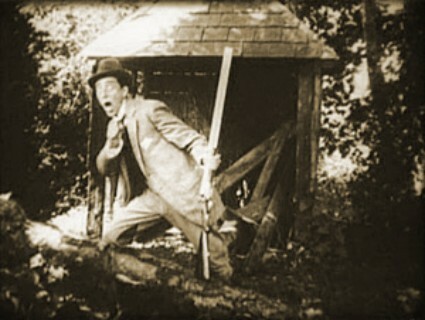 The first ‘genuine’ Holmes film would not be made until 1911, but with the name rapidly becoming a generic term for anyone on the detective trail, the great number of films that allude to Holmes in one way or another (most famously Buster Keaton’s Sherlock Jr.) are a part of the film history of Arthur Conan Doyle, if only because they show how tenuous an author’s hold can be on his original creation, once the public has taken it to their hearts. This post owes much to Andrew Lycett’s Conan Doyle: The Man who Created Sherlock Holmes, Alan Barnes’ Sherlock Holmes on Screen: The Complete Film and TV History, and Jay Weissberg’s notes for ‘Sherlock and Beyond:The British Detective in Silent Cinema’ in the 2009 Pordenone Silent Film Festival catalogue. There is further information on the films described above, and several other films not otherwise described here, in the filmography for Arthur Conan Doyle and the silent era of film which accompanies this post. The Sir Arthur Conan Doyle Literary Estate provides a present-day copyright statement for the European Community and the United States. This filmography accompanies the Pen and Pictures post on Arthur Conan Doyle and his involvement in film during the silent period. Instead of being strictly chronological, it divides up the silent films of Doyle’s works by producer and series, for greater ease of reference. There are also sections on individual films that weren’t part of any series, films of or about Doyle himself, and films which borrow Sherlock Holmes’ name or characteristics but which aren’t strictly speaking adaptations of Doyle’s works. Each record gives title, country, year, literary source, genre (using terms adopted by Alan Barnes in Sherlock Holmes on Screen), director, production company, leading actor, length, archive (where the film exists) and DVD (where commercially available). Any corrections or additions are most welcome – please add them to the comments at the end of this post. 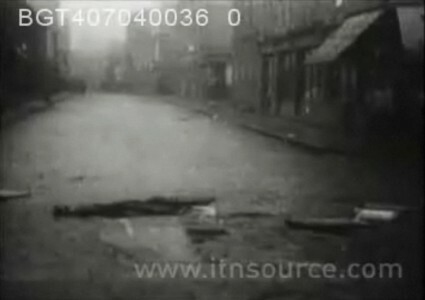 Films in which Doyle appeared (deliberately or inadvertently), including fiction films, newsreels and documentaries. Sherlock Holmes films that are not otherwise part of a series or collection of films made by a single film company. Films made of Doyle’s non-Holmes works that are not otherwise part of a series or collection of films made by a single film company. Danish series of detective dramas which used Sherlock Holmes as a name but which were not adapted from any of the Doyle stories. Some sources say that Mack Sennett starred in eleven Sherlock Holmes spoofs for Keystone, but these four titles (one made for Biograph) are all I have traced, so far, and the degree to which these were Holmes films at all is unclear. The first official Holmes films, sanctioned by Doyle. The first film was produced separately in France; the other eight were produced as a series in Britain. Authorised adaptations of two of Doyle’s non-Holmes novels by leading British film company. Unauthorised productions from American film company specialising in literary adaptations. Two series from producer Jules Greenbaum (or connected with him). The Arsène Lupin series featured the star of the earlier Nordisk series Viggo Larsen; the Der Hund von Baskerville series that followed (unauthorised) was initially made by Greenbaum’s Vitascope company in association with PAGU, but the two split and ended up producing rival episodes – see Alan Barnes’ Sherlock Holmes on Screen for an explanation of the complex history. Authorised versions by leading British film company. Unauthorised series of feature films which appear to have carried on the Nordisk/Vitascope tradition of exciting detective dramas borrowing Holmes’ name and little more. Some sources say there were up to twelve titles in the series. The classic adaptations of the silent era, starring Eille Norwood throughout and adapting most of the Holmes stories published to that date. 13. Holmes parodies, allusions etc. This is a selection of the many individual silent era films which parodied, spoofed, emulated or borrowed the names of Sherlock Holmes. No definitive list could be produced, given the all-pervasiveness of the idea of Holmes as master detective. Title, country, date and production company are given. This filmography has been compiled from many sources. Particular acknowledgments to Alan Barnes, Sherlock Holmes on Screen: The Complete Film and TV History, Jay Weissberg’s notes for ‘Sherlock and Beyond: The British Detective in Silent Cinema’ in the 2009 Pordenone Silent Film Festival catalogue, the German film database Filmportal, the two volumes of the American Film Index, Denis Gifford’s The British Film Catalogue and Books and Plays in Films 1896-1915, the American Film Catalog (online version), the Danish Film Institute online national filmography, and the Internet Movie Database.